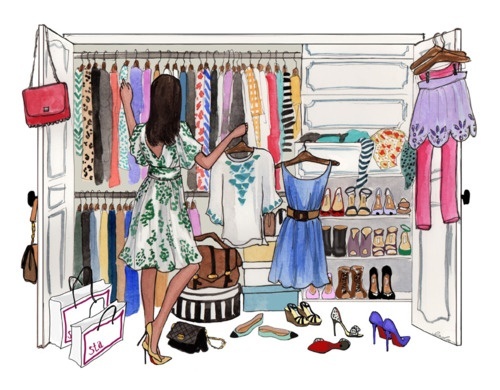 It's every fashionista's dream is to have a big extravagant beautiful custom made closet. 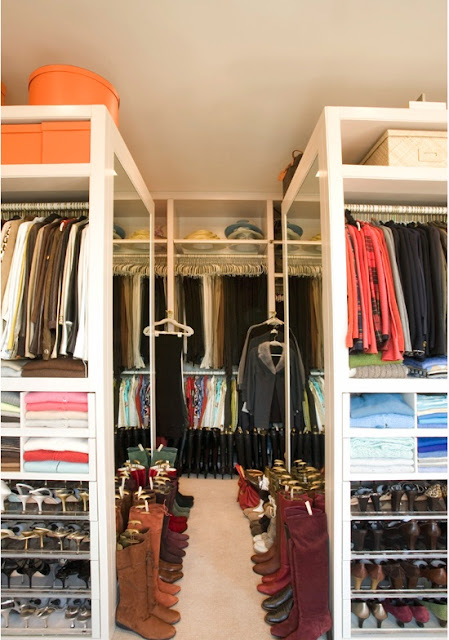 Here are some closets I lust after. It was about time that I cleaned out my room back in Texas. It was so cluttered and disorganized. I started with these two storage cabinets I had under my desk. They were just full of junk. I grabbed a trash bag and just trashed everything useless. And then grabbed a big tote and threw everything I thought I might need in there. After 2 hours of sifting through old memories all I had left was in one bag! As of the cabinets... I decided to donate them, since they did not match the interior design of the room anyways. I'm in the process of ordering these baskets to store the rest of the junk I had left over. was to fix up my bath room. I used to have this large dark wood jewelry armoire, that was very useful, but wasn't so "Cote de Texas" enough for my mother. So I cleaned it out, kept all the good jewelry and donated all the stupid Claire's jewelry I've bought over the past 10 years. 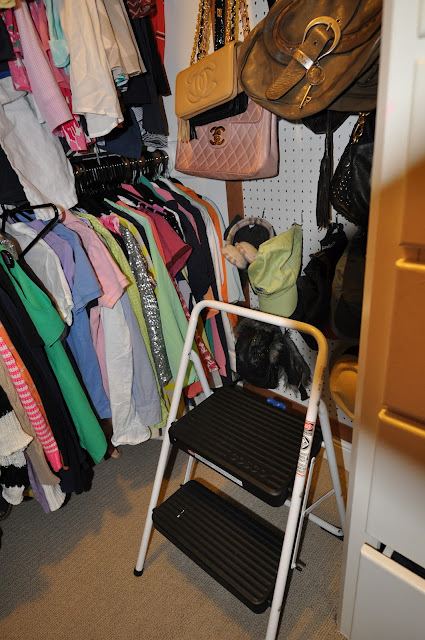 I also had this PB Teen pink make up stand, that had multiple baskets that swiveled around. A very handy piece, but too young and girly for my taste. Once again I threw away all the old makeup and random beauty products and donated the make up stand. 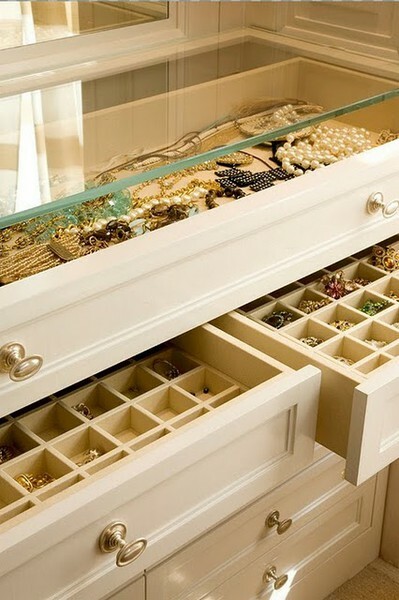 Next plan is to combine to make up and jewelry in to one storage place. 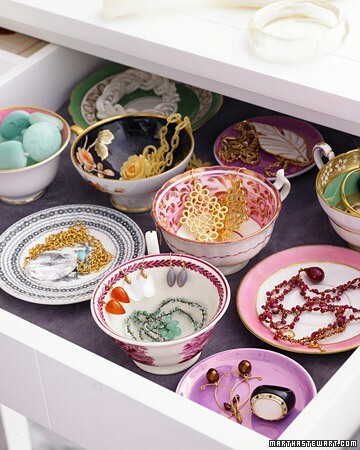 So I set out to find a perfect fitting book shelf to display my jewelry on and put my make up in baskets. a vanity stand to hold my jewelry and make up in, and possibly hanging shelves for extra storage space. I gotta say that Houston TX has UNBELIEVABLE shopping. All different types of stores with a multitude of different styles, for any type of taste you have in interior design or fashion or art. So I was trekking through the city visiting all the stores that my mother shops at, seeing if I could find the perfect piece to put in my bathroom. When finally I passed by this store called BoxWoods. Where they were having a huge moving sale. 50% off, or you offer a price and we will negotiate kind of deal. I swerved in to the parking lot and ran into the store. Not much was left, but low and behold there was my perfectly sized vanity for my bathroom. 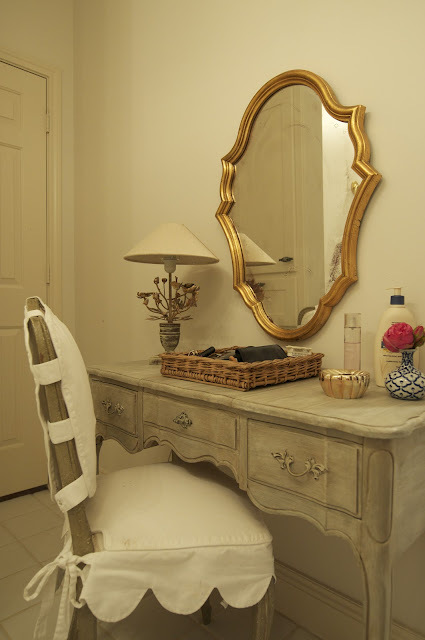 An antique styled narrow vanity desk. Priced at 1,200.... and finally marked it down to 700. Loaded it up in my car, carried it up the stairs and placed it in my bathroom. Found a few decorative accessories to put on top, to spruce it up. 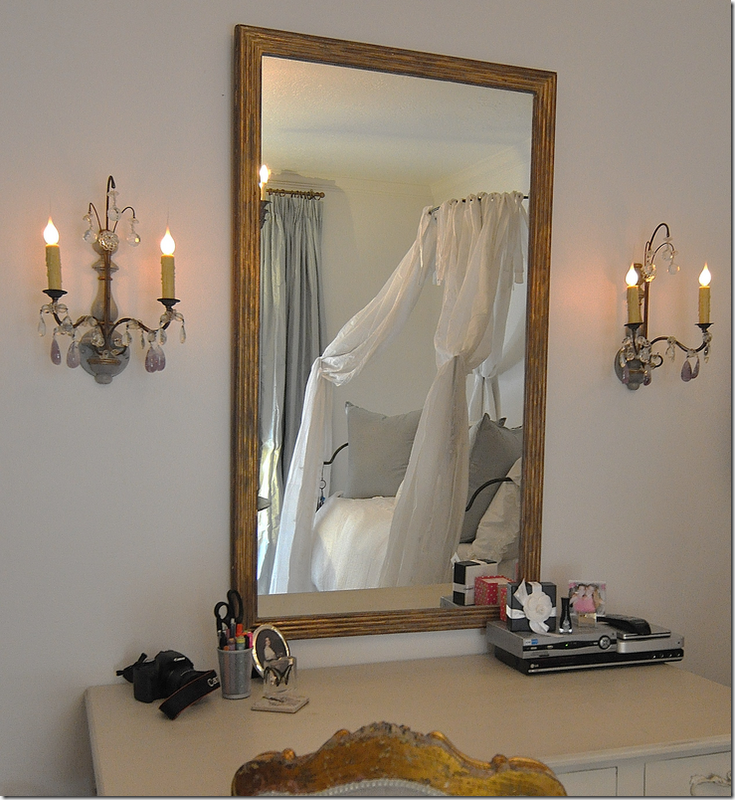 Placed a replica antique mirror on top and v'uala a new set up. Thank fully my mom has a great collection of decorative accessories piled up in the garage that I snatched up. The best part about this vanity is that it has 3 storage compartments. The middle has a deep compartment to hold make up or jewelry. 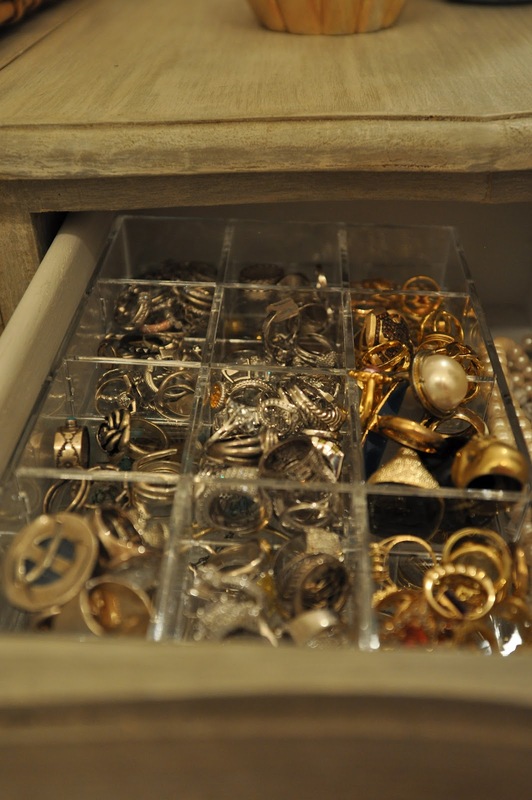 I decided to put the jewelry that I wear everyday in there. 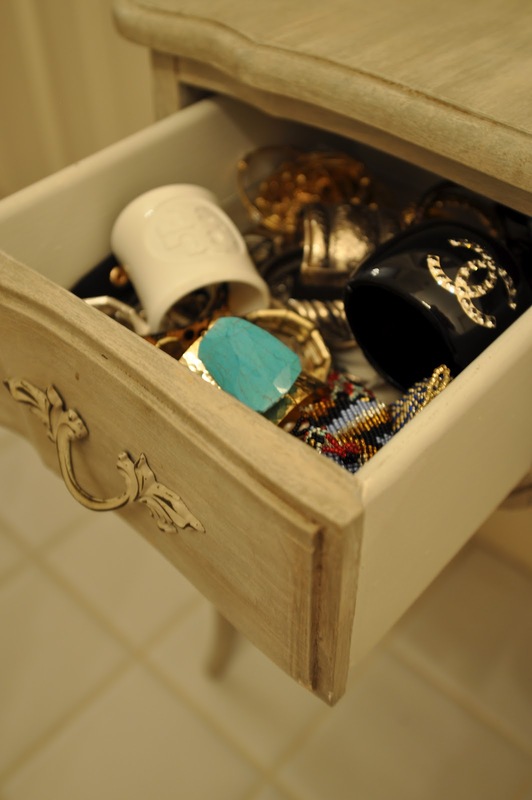 On the sides there are two drawers that I put the rest of my jewelry in. I bought these acrylic jewelry trays from The Container Store. 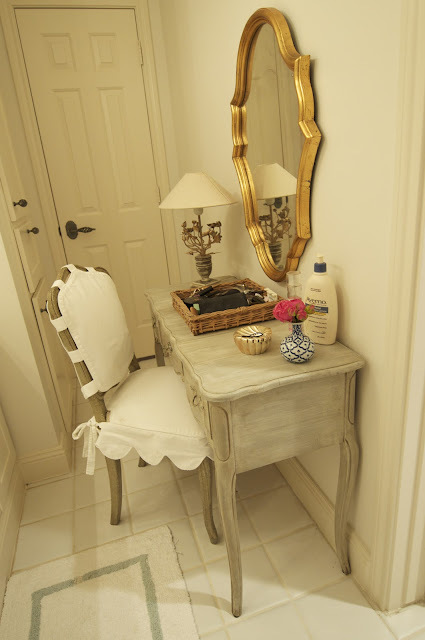 Got this cute little lamp from the Cote De Texas garage boutique, along with the wicker tray holding my makeup, the mini blue and white porcelain vase, and the two prints hanging in my bath room. 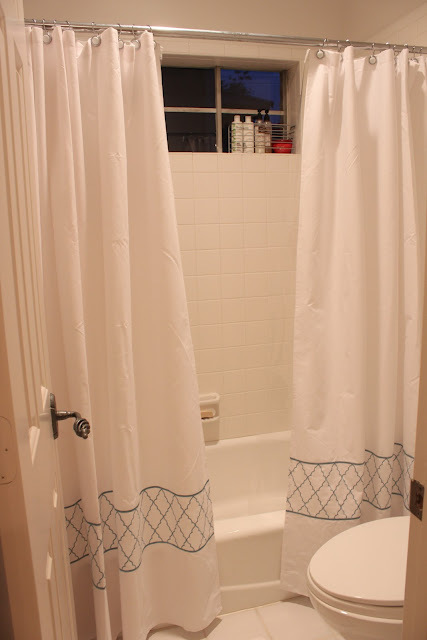 I decided to change out my shower curtains to a double shower curtain. 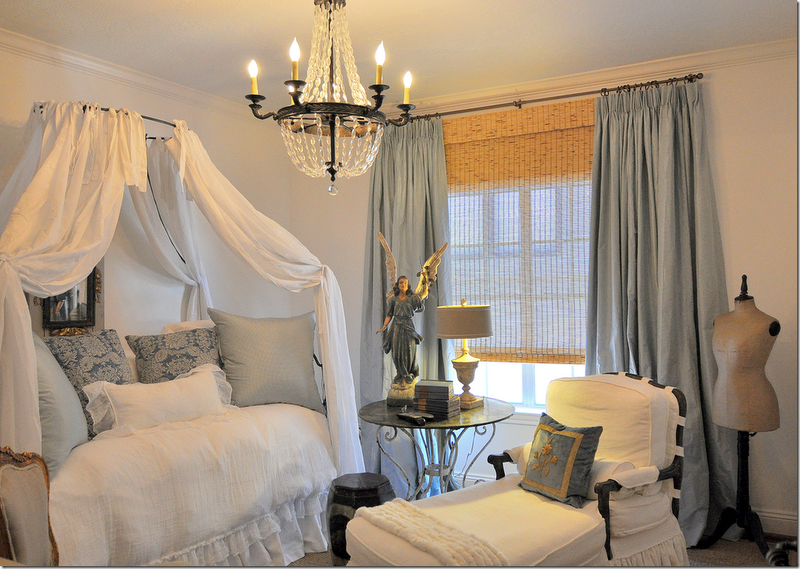 Bought these white and blue trellis styled curtains and white rings at Target. 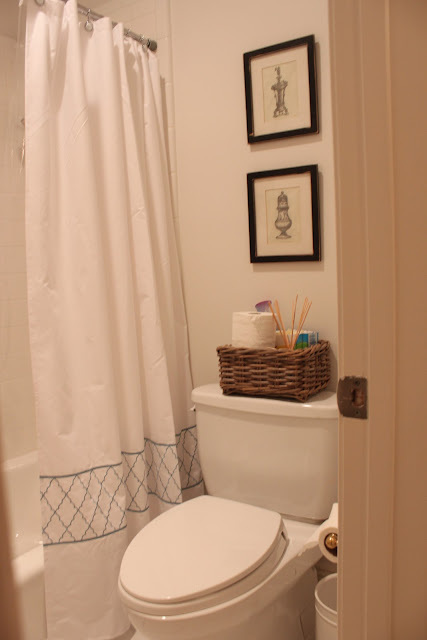 The cute blue and white bath rugs are from my favorite store Home Goods. I grabbed a basket from the garage and put some necessities inside. 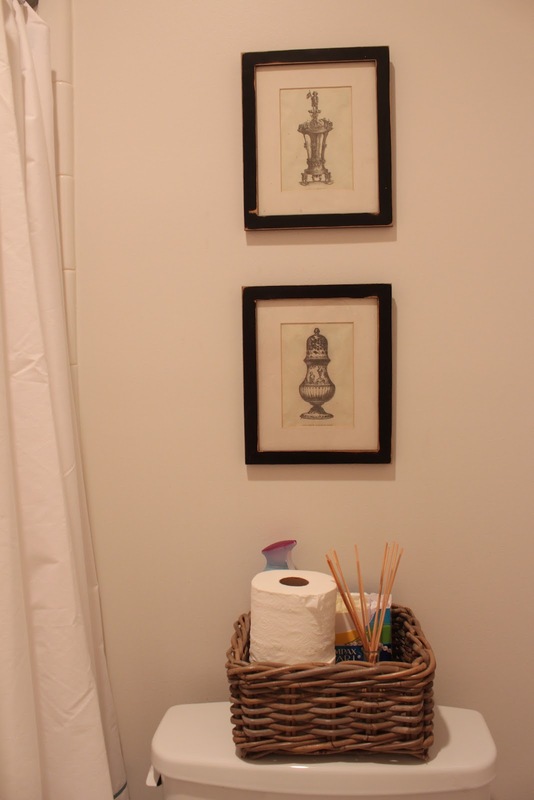 toilet paper, lady products, Febreeze, and my favorite diffuser William Sonoma grape fruit. Lastly I hung up these two pictures to bring more character to the bathroom. to clean out my closet and rearrange the set up. I should've taken before an after pictures, because the transformation is awesome! 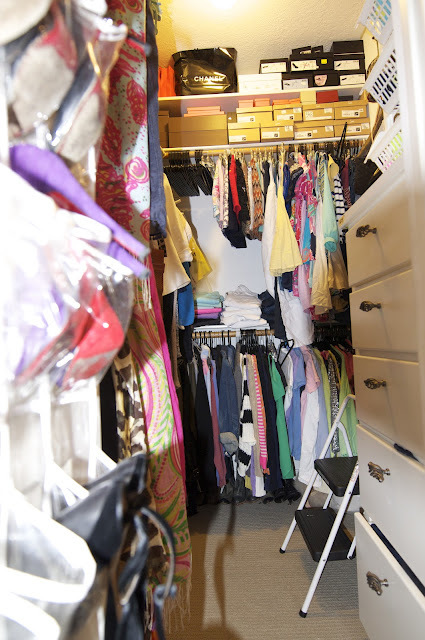 The way I clean out my closet is to pick an area to start, and just throw all the things you haven't worn in the past 2 years away-- then decide what you will do with it either donate, give it away, or sell it. Then just keep going, section by section. Once I finally wiped out my whole entire closet clean... literally. I decided to organize my collection of boxes I keep above. My one weakness is shoes... I have a lot of shoes and I can never get rid of them, so I had to find a good storage spot for them. I decided that I would just find a small portable shelving unit. So I grabbed these white wired stands that can stack up on top of each other, from The Container Store. And placed them on the side of my closet with the most height. A while ago my mom hired a closet organizer who put these great peg boards on the empty walls of my closet, so I could hang up my purses, hats, scarves, and whatever I wanted. Perfect idea, takes up no space at all and is totally out of the way. 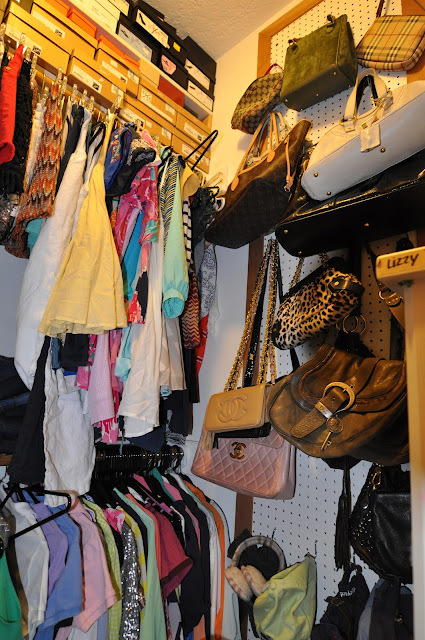 Best thing I've ever had done to my closet. Final part was hanging up all my clothes, which took longer than I thought. 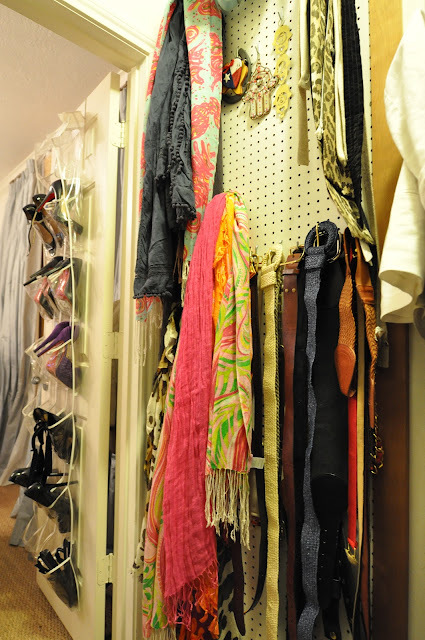 My one OCD closet organizing thing is I have to have all black hangers, everything is organized into categories and designers. The right peg wall. it's a pretty tall wall I needed to take two pictures! Skirts and dresses... jeans are folded up on middle shelf. This is the long hanging section on the left of my closet. all these clothes are clothes that I kept from the clean out. 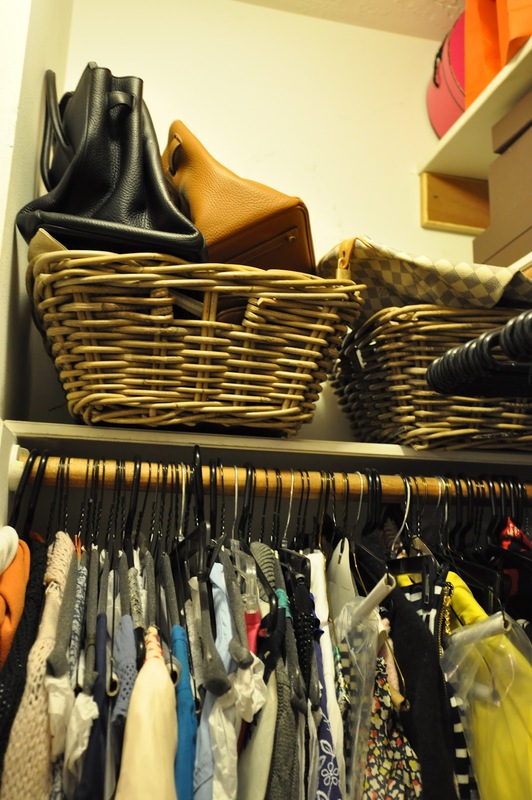 Baskets of clutches and accessories, threw a couple of purses on top. These are the rest of my shoes. 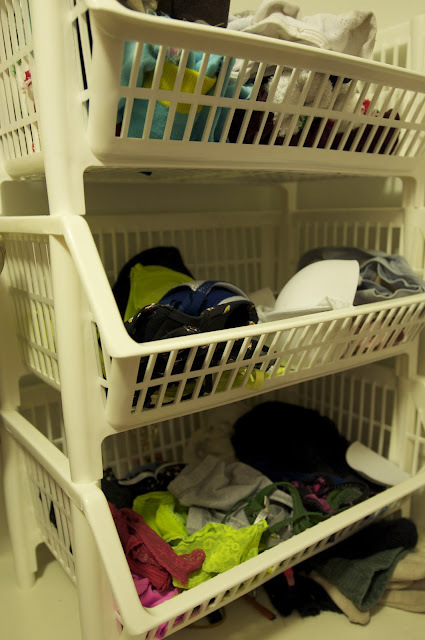 the rack is under the long hanging section on the left and the boots are hidden behind the shirts section. stay tuned for an update on my dream summer job! oops! i meant to spell voilà! 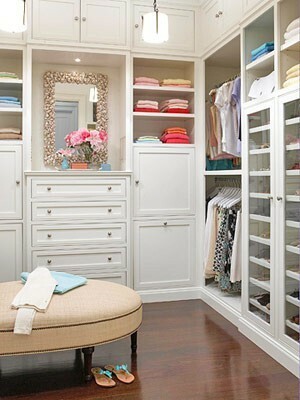 Organizing is the key! You really need to organize your closet at least once a month just to keep it clean. 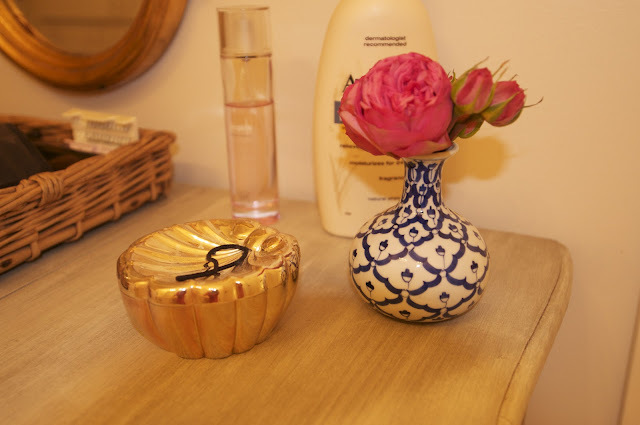 By the way, your bathroom looks amazing! It's sparkling clean and I love your mat.